21 May Does My Child Need Braces? Orthodontia is about far more than a pretty smile, though we think that pretty smiles are important as well! The fact is we need our teeth to chew and properly digest our food. With good care, our teeth should last a lifetime. Bite issues, jaw malformations, and other problems can interfere with our ability to chew properly. If you’ve read our articles, you know that it’s best for your child to see a Pediatric Dentist when his or her first tooth erupts. Regular visits allow us to catch problems early when they can be far easier to address. 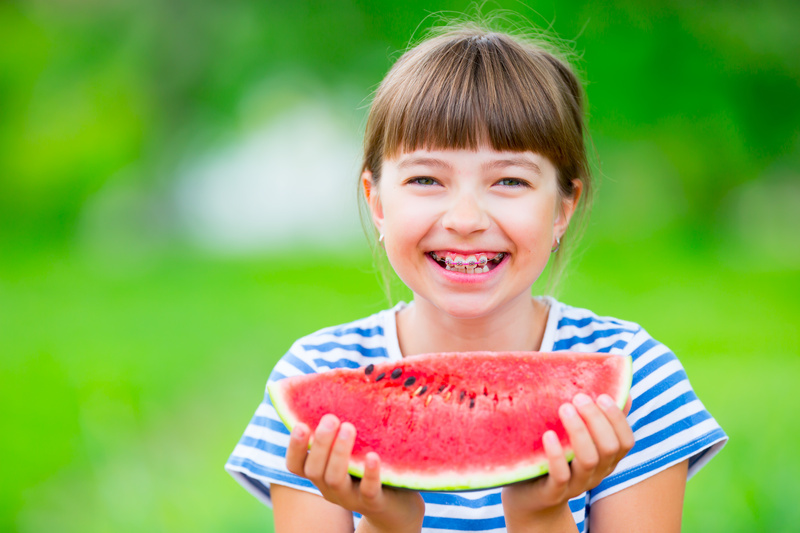 What are some of the signs that my child might need braces? Why does my child have these issues? Issues such as crowding – or teeth that don’t meet correctly – are quite common. Most of these problems are inherited – if you had braces, it is more likely that your child will need them. Thumb sucking, dental decay, and accidents can be other reasons a child will be a candidate for orthodontia. Sometimes, there simply isn’t enough room on the jaw for all the permanent teeth to erupt, which can interfere with the jaw alignment. Why should these be determined early? Often, issues discovered early can be addressed with minimal invasion. Sometimes, extracting a tooth can eliminate the need for braces later on. Any issues with jaw development are much easier to treat when your child is young. What is the best age to evaluate my child for orthodontic care? If we have been seeing your child on a regular basis since he/she was small, we have the advantage of discovering the need for intervention early – and can help you determine when orthodontia will be easiest on your child as well as most effective. Orthodontic treatment commonly begins between the ages of 9 and 15. Children in this age range have some of their permanent teeth, but their bones are still growing which makes the process easier. Other children can benefit from a thorough evaluation as young as 5 or 6. Crowding: The dental arch may be small, or the teeth too large for the arch. The bone and gums over the roots of crowded teeth can become thin as a result of overcrowding. Teeth may be aligned poorly because the dental arch is small and/or the teeth are large. The bone and gums over the roots of extremely crowded teeth may become thin and recede as a result of severe crowding. Teeth that are impacted (they have not yet erupted, or are partially erupted) may cause crowding, poor bite and a less than desirable cosmetic appearance. Protruding upper teeth: Teeth that protrude beyond the normal spacing needed between the lower front teeth often indicate poor molar alignment. They are more prone to injury. At times, they can indicate a short lower jaw or irregular jaw growth. Deep overbite: When the lower front teeth (incisors) impact the upper teeth or gum tissue, it can cause excessive wear or even bone damage. Open bite: when the upper and lower front teeth (incisors) don’t meet when biting down, all the chewing pressure is transferred to the back teeth. The rubbing that subsequently occurs can cause tooth wear and make chewing difficult. Excessive space between teeth: If teeth are missing (either due to injury or impaction) it may cause the other teeth to misalign in an attempt to fill the gap. Crossbite: If the upper teeth bite inside the lower teeth, it will lead to discomfort and chewing difficulties and can even affect jaw formation. Underbite: If the lower jaw is longer than the upper jaw, the lower front teeth will protrude in front of the upper front teeth. This is an issue that should be addressed sooner, rather than later, as it will negatively affect jaw growth. How do I know my child is emotionally ready for braces? Your adolescent might be embarrassed by his crooked teeth. This attention to how he looks to others can be a signal that he’s ready for the added responsibility of braces. Many children need treatment prior to adolescence but are not mature enough to cooperate with the necessary cleaning involved. Others can be very cooperative even at 7 or 8 years old. Many factors must be considered. Is there an issue with the jaw that must be corrected as soon as possible? Or is it as simple as an overbite, which can be more successfully treated when your child reaches his or her teen years? Even the most responsible and mature teen will need some parental supervision when undergoing treatment. Many teens request Invisalign. They require even greater attention to brushing and cleaning and must be removed every time your child eats or drinks (except water) and teeth brushed prior to re-inserting them. Each child is unique – in readiness for the extra care and attention needed for braces, as well as their individual orthodontic needs. We’re happy to help guide you in making these decisions with your child.